You are here: Home » Bathtub Remodel, Shower Remodel » Best material for showers and baths? Acrylic! What is the best material for showers and baths? The answer is acrylic. 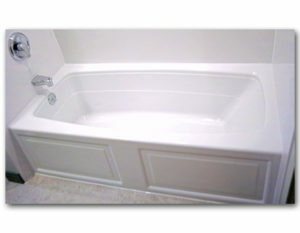 Acrylic bathtubs are smooth, warm to the touch, and non-porous, so the scum and bacteria can’t find any crevices to lurk in, unlike tile and fiberglass. When I use the shower, I squeegee once and I’m finished. There is no scrubbing necessary! When I had a tile shower, I would spend the entire morning trying (and failing) to get the yuck out of my old tile, only to have it grow back again within weeks. This is NOT my idea of a good time! So I LOVE acrylic! If you don’t like to squeegee, you can also wash acrylic with a soft cleanser like formula 409, if you prefer. All in all, counting other factors like ease of installation, cost, and versatility, acrylic is a wonderful material for anyone’s bath or shower remodel! We here at Best Fit Bath are experts when it comes to acrylic and we can’t wait to show you how it would look in your new bathtub or shower! Give us a call!